Most people can’t function normally without their cup of coffee in the morning. This post is for them. This post is also for the rest of the folks like me, who sit on the fence when it comes to coffee. 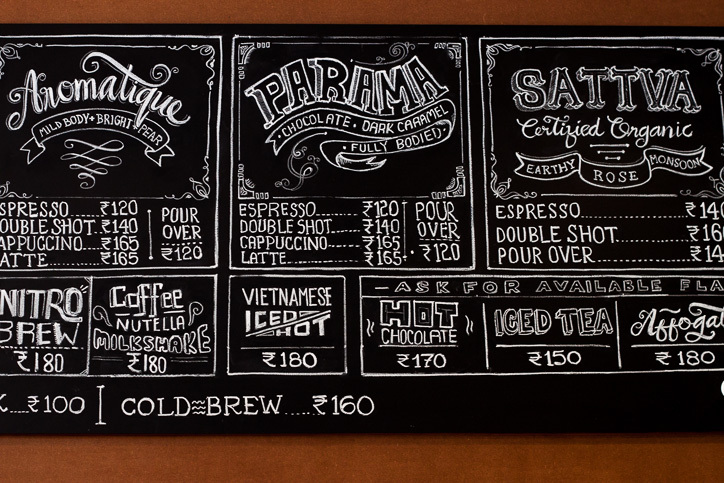 Espresso, Americano, Cappuccino, Latte, Pour Over, Nitro Brew, Cold Brew – ordering coffee is no longer restricted to the customary ‘one-by-two’ kapi in a darshini. With hipster Roasterys making their appearance across Bangalore, I thought it’s best we educate ourselves. Ready? The Flying Squirrel (named after the eponymous animal that abounds in Coorg coffee estates) is an artisan coffee brand founded in 2013 by Ashish D’Abreo, Tej Thammaiah and Phalgun Chidanand. After retailing online across 32 cities in India, the grew roots in Koramangala as The Flying Squirrel Micro Roastery and Café. The passionate coffee connoisseurs want to offer everyone a chance to experience their seven gourmet, artisan blends of coffee sourced from their own estate in Coorg. The café also serves as a delightful space for on-site roasting, brewing techniques, experimental blends, and coffee retail. We were invited last week to sample their trendy cold brews, that are right on the money for summer. A brief foray into the ‘Bean to Cup’ process for coffee (picking, husking, pulping, fermenting, drying and roasting) and I was already reeling with how much work and dedication it requires to get a quality product! The process is as, if not more sophisticated that growing grapes for wine. The terroir and process of cultivation can result in different varieties that satiate different palates and The Flying Squirrel offers seven diverse blends that are up for grabs. The ones that caught my attention were Clouds in My Coffee – processed naturally, using sea-side moisture-saturated air to create a distinctive bold, deep flavor, Aromatique – a select Arabica single-estate, naturally processed coffee with mild sweetness and an almost wine-like rounded acidity and Sun-Kissed – a single-estate coffee, processed using the Pulp Sun-drying method to result in a fruity brew. These artisan coffee beans are freshly roasted and ground on site and offered to the discerning customer in a multitude of styles. Let’s get the lowdown on your cuppa! Espresso – brewed by forcing a small amount of nearly boiling water under pressure through finely ground coffee beans, resulting in a foamy top layer. Generally used as the base for other coffee drinks. Americano – espresso with added hot water, giving it a similar strength but different flavor from drip coffee. Latte – Espresso and steamed milk. Cappuccino – an Italian favourite that is traditionally prepared with double espresso, hot milk, and steamed milk foam. 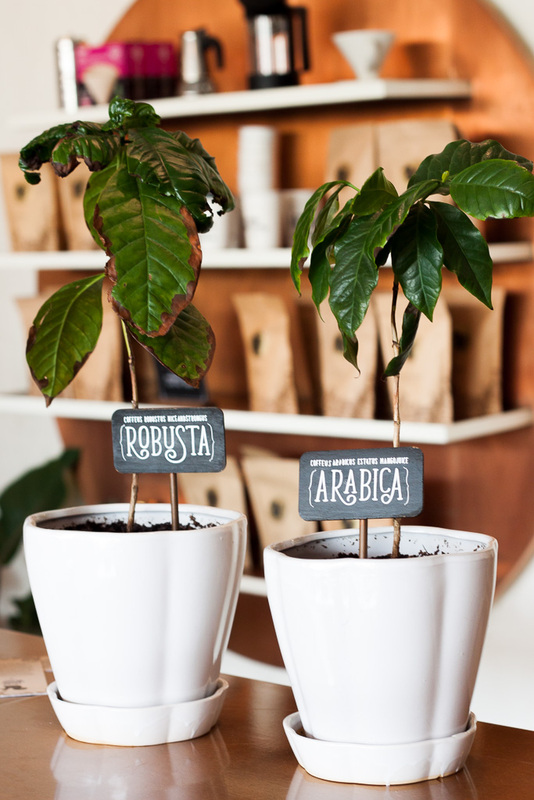 Now coming to the hipster variants that are propelling coffee culture across the world. 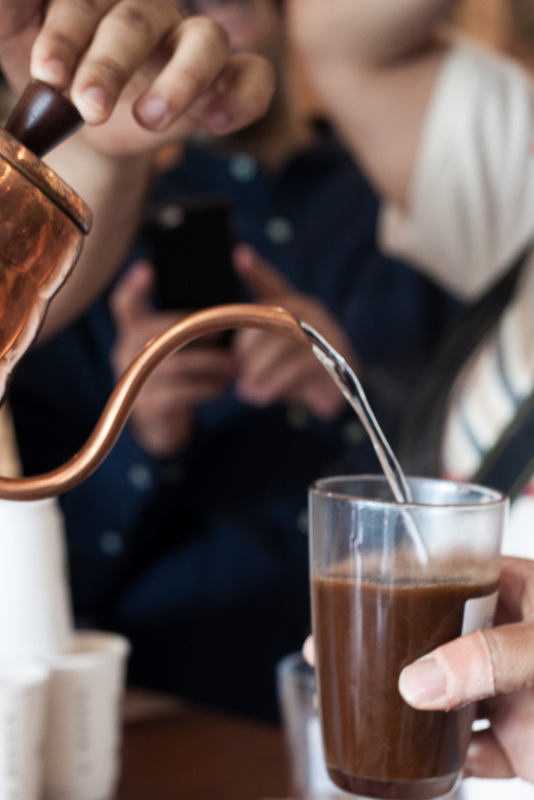 Pour Over – involves grinding enough beans for a single cup of coffee, using a cone brewer with filter, and then custom brewing one single serving of coffee by pouring hot water over the beans. Nitro Brew – cold-brew coffee infused with nitrogen gas released through a pressurized valve with tiny holes. 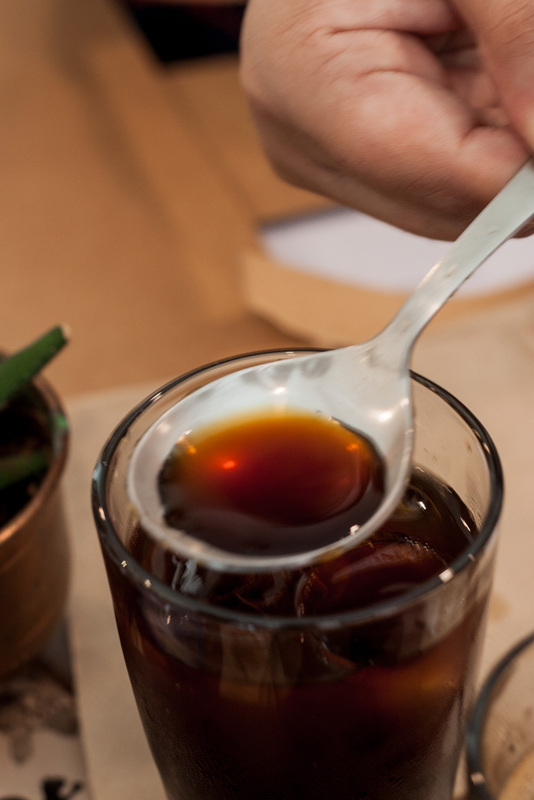 The high pressure forces the cold brew past a disc, creating a creamy, stout-like effect. We had heard the theory, now it was time for some practical’s – we were going to make our own cold brew in a Brewing-Cupping-Tasting session. Cold brews are typically less acidic than their hot brewed variety and the brewing method keeps the bitterness in check resulting in a sweeter, smoother brew. The process is so simple that I’m inclined to repeat the same at home very soon! COLD BREW PROCESS: In a large glass or steel container, add the coffee grounds. Top with cold water in a 1:4 ratio for the best body and aroma. Stir well, cover and let it sit in the refrigerator for 12-14 hours. You can filter the resulting brew in a number of ways, but I found the muslin cloth version the easiest (and most cost effective!). Place a muslin cloth over a mouth of a jug – fastened around the rim with a rubber band or string. Pour the coffee brew gently into the muslin strainer. Like Ashish said, “Let gravity do its work. There’s no need to squeeze every last drop out like how your mom would extract coconut milk”! Once filtered, the brew can be kept in a closed bottle, in the refrigerator for upto 8 days. The best way to drink it is on the rocks, but if you’re a coffee novice like me, a dash of milk and sugar might sweeten the deal. 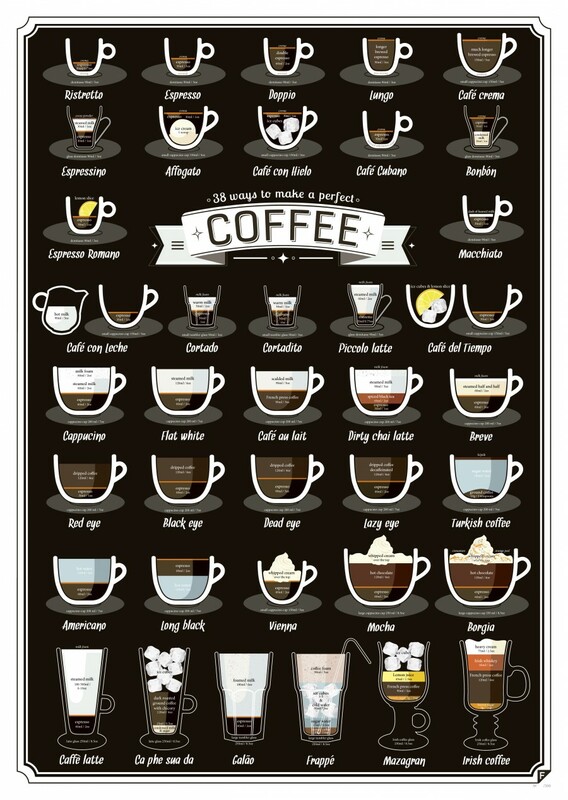 If you’re a coffee virgin, I would suggest some condensed milk, Vietnamese Style or even some Ice Cream a la Affogato. You can even take your cold brew to the next level by nitrogenating it. The Nitro Brew is like the Guinness of the coffee world. 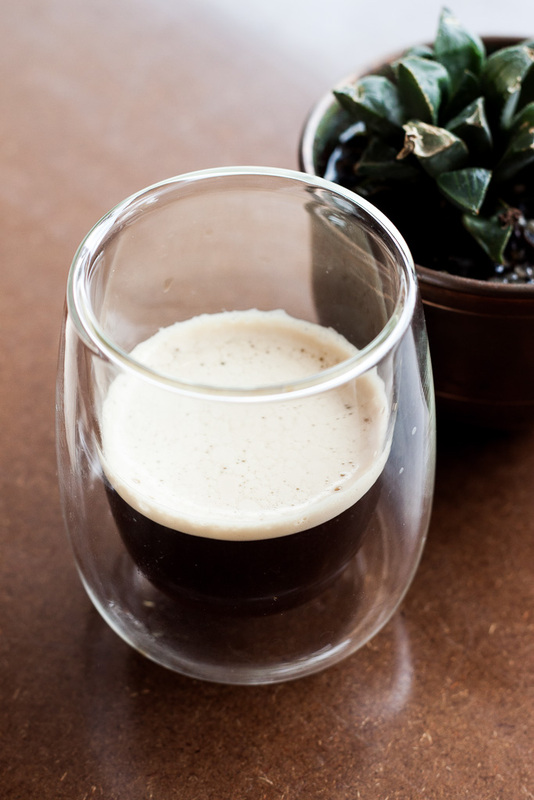 For the coffee die-hards, this creamy, dark, stout-like brew will be heaven in a cup. For the others – proceed with caution! The café does justice to the food it serves as well. 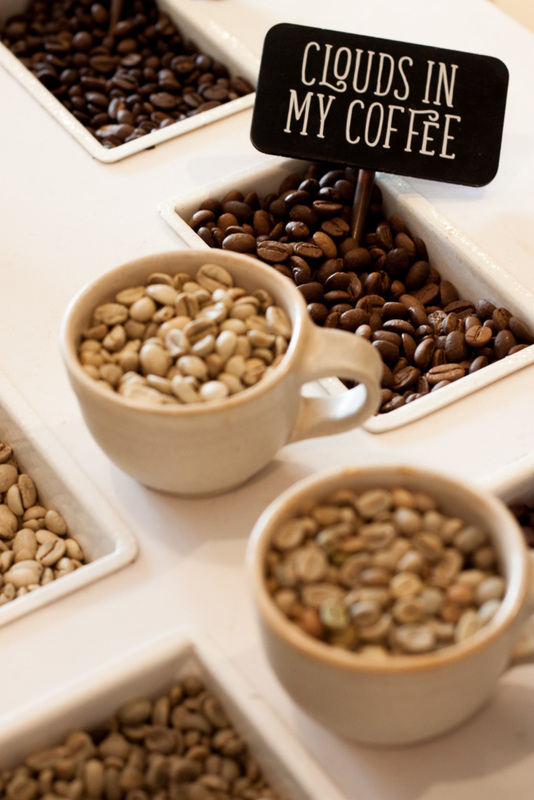 Using locally grown fresh produce, the Euro themed fare is given the Coffee-Estate hit with various clever inclusions. Like the Coffee-wood-smoked Caesar and Buckwheat Noodle Salad, Spaghetti with Coorg bird-eye chilly, jumbo prawns and Parmesan or the Pulled Pork Sandwich where the pork is slow-cooked in the famous Coorg spices and Kachampuli. The desserts also go the coffee way with the Parama coffee infused Crème Brulee. Here are some pictures of our delicious lunch. We were all given a little Cold Brew Kit, complete with the coffee blend and muslin cloth. I can’t wait to use the cold brew in a Coffee ice cream – should be a perfect summer pick me up!